You are no doubt familiar with the internal workings of a hydraulic volume controller: a pressure balance, consisting of an unbalanced spring-loaded piston, controls a second flow restrictor so that a constant differential pressure is maintained across the first flow restrictor. 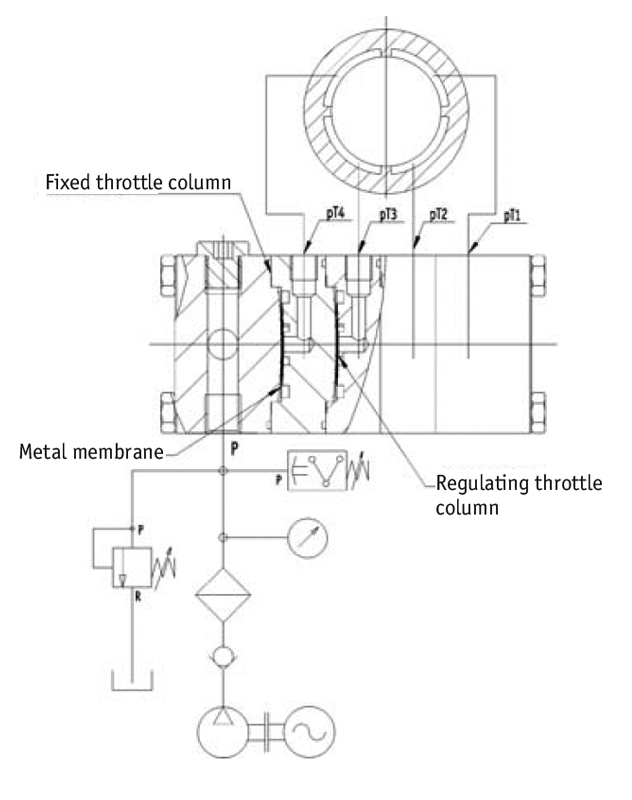 As the flow through the first flow restrictor of the PM flow controller is always laminar, just like the gaps of the hydrostatic pockets, the flow of fluid through the controller and the hydrostatic pockets changes due to the varying fluid viscosity in a similar way. 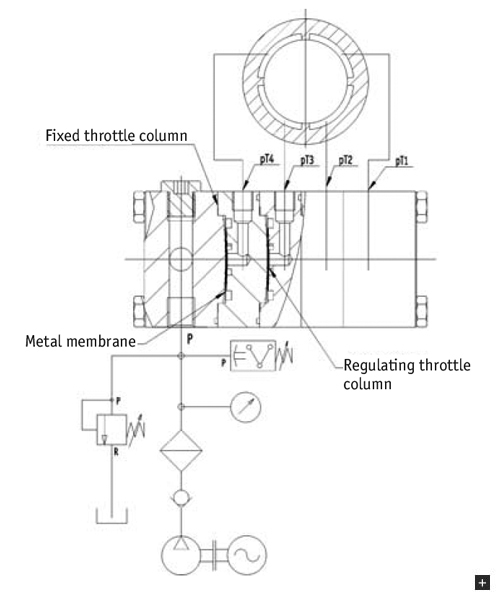 This means that the stiffness and load capacity along with the gap sizes and pocket pressures remain constant, regardless of the fluid viscosity. If the fluid viscosity changes, e.g., due to differing fluid temperatures or a change of fluid (the permitted viscosity tolerance of an oil grade according to DIN is ± 10%), then the machine properties will hardly be affected. Only the required fluid flow and, to some extent, the damping properties, will change. As the fluid flow is only controlled by the elastic deformation of the steel spring disc, i.e., there are no sliding motions, the PM flow controller works without wear or hysteresis. Due to the low mass of the steel spring disc and high regulating forces, the PM flow controller acts very quickly, with natural frequencies many times above the applicable energising frequencies for mechanical engineering. As there are no sliding elements, the controller is also maintenance-free. 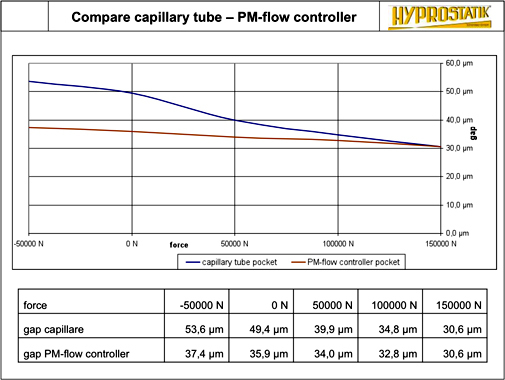 If the supply pressure (=pump pressure) is constant and the hydrostatic pocket load is rising, meaning increasing pocket pressure and therefore outlet pressure on the hydrostatic pocket's controller, the PM flow controller also raises the fluid flow level. This is how four-fold increases in stiffness (! 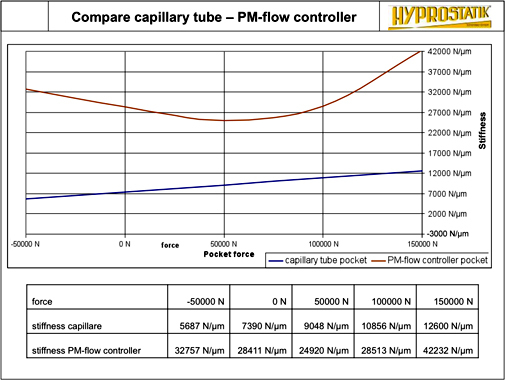 ), compared to capillary solutions, are achieved. The PM flow controller therefore also has the very unusual ability to increase the fluid flow through the controller when the differential pressure on the controller is falling.